The BBC has commissioned EastEnders' first ever online spinoff soap to target its younger audience. Described as a "naughty little brother or sister to the main show", EastEnders: E20 follows the lives of four teenagers who turn up in Walford in search of an escape from their troubled lives. Each of the 13 stand-alone webisodes has been penned by new London writing talent aged between 17 and 22 who all attended summer school where the drama was incepted. The 6 to 12-minute instalments are due to begin airing online via the show's official website and iPlayer from January and will tie in with EastEnders' 25th anniversary celebrations. The miniseries will be made available three times a week, immediately after the main show has aired on BBC One. Casting for the teenage roles has yet to be announced, while it has been confirmed that regular EastEnders characters will make cameo appearances. EastEnders' executive producer Diederick Santer said of the venture: "These talented writers are creating a whole new Walford, infused with their own experiences of London life. "A fresh perspective on a British classic, EastEnders: E20 will - I hope - delight new audiences and EastEnders diehards alike." Darren is Trott tot's dad! Rob: I need to hit the gym! 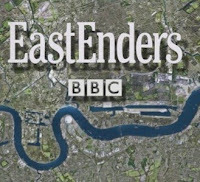 EastEnders live ep to resolve murder mystery? Will Archie gain control of The Vic?